In order to fix a problem, it is necessary to start correcting things at the first important point. I would suggest that we lobby our Government representatives to make it a jailable crime to mistreat any & all animals. “donate money to the OSPCA”. What on earth for? They don’t change laws. They clean up our mess. They get paid to do so. Any donations are put right back into pretty brochures of happy puppies and the latest in cable channels on their new big-screen. They don’t lobby the government for changes, they expect us to do that. Those horses could still end up on a meat truck. sigh. and no, you can’t just “set them free”. Unless you want them to die slowly in a backyard, or in some garage. Breeders MUST be regulated through legislation NOW in order to curtail their irresponsibility. This irresponsible industry should be FORCED through legislation to help finance costs to Humane Societies, and Horse rescues.AFTER ALL, THEY ARE RESPONSIBLE FOR THIS ISSUE. Horse slaughter in Canada, and transport to countries who still practice this BARBARIC killing ,should be BANNED through legislation[ billc322]NOW. Like those responsible owners of dogs or cats, Horse owners should retain the services of a LICENCED VET for end of life for THEIR COMPANION ANIMALS. And yet people keep breeding!!! Can we not start a petition to ban the breeding of horses for a few years?! I wish it was possible. Sadly it’s not just the race horse breeders… it’s the idiots on kijiji trying to make money selling foals!! Get a job. Stop trying to make money off animals!!! These people disgust me. AGREE WITH CAROL. SUCH BEAUTIFUL SENSITIVE KNOWING ANIMALS CAN’T BE CAST AWAY AS IF THEIR NOTHING ! THE WAY THE HORSES ARE TREATED IS A DISGRACE TO HUMANITY. MAY THE FATHER BE WATCHING !! Correct me if I am wrong but wouldn’t it make sense to nurse whatever horses are in need back to health and then release them and all the others in the racing industry so they can be free? As we all know over-breeding is a way of life for all horse breeding operations in the US and in Canada. These people don’t care what happens to any of the horses that they are responsible for bringing into the world. If the horses aren’t bringing in the money they are gone. The owners bottom line has to show a profit or they go out of business. The problem is these are living breathing horses that never asked to be here in the first place. These horses are not cars that can be traded in for a new one but that is the way the breeders treat them. All of the brood mares that produce the thousands of foals every year are disposed of the same way as their usefulness is used up. Slaughter is what keeps the racing industry going, having the slaughter option open to them at all times keeps them over-breeding constantly looking for that magic horse to bring them riches and fame. Right on Barbara! The businesss of slaughter helps support the breeding industry, racing industry, etc. 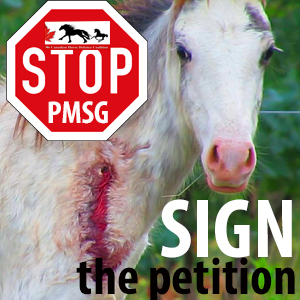 If we STOP slaughter it will be so much better in all these avenues for horses! You are bang on right 100%. I know for a fact, most racetrackers don’t give a crap about their horses lives after running service ends. Very, very sad and completely unacceptable. Commercial breeders, backyard breeders, STOP IT, JUST STOP IT, when was that last Triple Crown winner you produced? It will be interesting to see what, if anything, the racing industry intends to do about this situation. 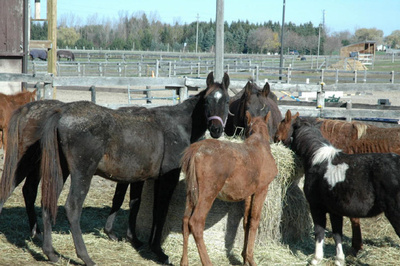 They have benefited from generous Government subsidies (Quebec) over the years, and it is now the time for owners,and the industry, across Canada to prove the love they profess for these animals and come to their rescue. Pumping more money into the industry will only prolong the inevitable. The industry sees these creatures as money makers and when they don’t produce at the track or as breeders it is generally a trip to the slaughter house where the owners get a few extra dollars. Horse racing is a rotten business and I look forward to the day when it ceases to exist. First, the racing industry needs to put aside money to take care of unwanted horses until they can be re-homed….it is there responsibility. These horses made money for them during their career. Second, indiscriminate breeding practices have to stop. This is just insane to keep breeding when there may not be an industry to support them. Finally, where does the $7,000/month to keep them fit in? I own 3 horses and it doesn’t cost me $600/month each to keep them and this includes shavings, (they are kept in a barn in the winter), hay (a bale each per day) and grain. I think it would be a wonderful gesture if stable owners, trainers, jockeys and all those who have made money off of horses in the past, would step up to the plate, so to speak, and donate money to the OSPCA, and the rescue organizations, who work so hard with limited funds to help save as many of these beautiful creatures as they are able to, after they have been cast off by the industry. Breeders never seem to learn or I guess they just don’t care. They have the mentality that I’ve been breeding horses for 40 years and i’m going to continue come hell or high water. An Alberta breeder was set to sell yearling anf foals at the local auction here in B.C.on Friday but an outbreak of Strangles forced them to cancel. They had a production sale earlier this fall so this group probably didn’t sell. Every fall out of province breeders dump foals for barely the cost of transportation just to make way for the next years crop. The SPCAs should revise what it costs to feed a horse across the country. No way would it cost $7,000.00 a month to feed 13 horses. At $10.00 a bale which is usually at least 50 pounds one horse would only eat 15 a month at the most or cost $150.00 a month for hay. Everything else is extra.